The blissful, fast-paced, action-packed sequel, “Geometry Wars: Retro Evolved 2” is finally here and it is truly a masterpiece of gaming perfection. Anyone who has played and enjoyed the original remake, “Geometry Wars: Retro Evolved” is in for a surprise. Not only does this game contain the original “Retro Evolved” mode as an unlockable feature, but there’s also a whole slew of new content, as well as the much awaited co-op multiplayer mode. So, does the game deliver on all of the hype and excitement? 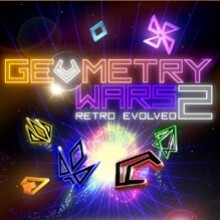 Let’s find out as I delve into the highly anticipated action fest otherwise known as “Geometry Wars: Retro Evolved 2”. First of all, for those who have no idea what this game is, this is not a 3D game. Just walk away and play something else if you can’t handle that fact. With that out of the way, I have one thing to say: “Geometry Wars: Retro Evolved 2” has the most impressive 2D visuals to date, as far as I’m concerned. Everything is bright, shiny and colorful. Everything, from the simple wave effect of the grid to the beautiful particle explosions is an overload of top notch eye candy. This game definitely has that “Ooh, aah!” appeal that fans of the original game have come to know and love, but on a much, much higher level. On that same note, sound quality has the same degree of awesomeness as the original game, but with a bit more variation and I have to say, the new songs are, for the most part, just as awesome as the one song in the previous game. There’s a re-mixed version of the original song for the gameplay mode based on the original game, which sounds even better in my opinion, but there are a handful of other great electronic tracks that are sure to get your adrenaline pumping to help stink you into the action just as much as the original. The same can be said of the sound effects, which are virtually identical to the original game, although that’s not an entirely bad thing. I would have enjoyed hearing a few new things, but I don’t even think it’s a big deal considering the style of game and the fact that it sounds great anyway. And now for the moment everyone’s been waiting for: Does this game have that same “Oomph!” as the previous game in the series? Yes, yes and more yes. This is by far a 10-fold improvement over the previous game and it makes the original “Geometry Wars: Retro Evolved” seem pointless to own anymore. So, why is this game so much better? Well, for starters, multiplayer is officially live and works like a charm. The game never has any FPS drop or slowdown, regardless of if you’re playing 2, 3 or 4 player modes. The only downside is that there appears to be no Xbox Live multiplayer as of this writing, which is a damn shame because that would have easily increased the replay value of the game to a completely limitless extent. Still, as if that weren’t enough, there are also a total of 6 gameplay modes to sink your teeth into, which are all unlocked rather quickly over time by playing each mode for a brief period of time. The first mode, titled “Deadline”, is a quick 3 minute score attack in which players are given unlimited lives. Second, we have “King”, which restricts players from shooting outside of circular “zones”, but enemies are restricted from entering those zones, so it’s a double-edged sword. Third is the return of the “Evolved” mode from the previous game, but with the new enemies and graphics, as well as the remixed music track. Fourth is “Pacifism”, which tasks players to survive as long as possible without being able to fire a single bullet. Fifth is “Waves”, which uses the primary new enemy types a whole lot to force players into shooting gaps in between immensely large swarms of enemies to survive. Finally, “Sequence” is a challenge mode of sorts which throws the players into a series of 20 challenging stages, all of which they must complete in 30 seconds or simply survive long enough to reach the next part of the sequence. All told, unlocking every mode took maybe 1 full hour, playing on and off while I was talking on my phone, so there’s not a whole lot of trouble involved in the whole unlocking process, which is really awesome for this type of game. Many players just want to dive right in and check out the new modes and in essence, they can do that almost immediately. As for achievements, there are a total of 12 achievements of varying difficulties. Some of them, such as the basic “Unlock all modes” achievement, are extremely easy to attain, while others, such as “Smile”, are incredibly difficult without a very high degree of skill. I personally have achieved everything except “Smile” and it only took me a total of around 2 hours to do that, so anyone with some degree of skill and reflexes should be able to attain almost every achievement relatively quickly. As usual, the total gamerscore that any player can possibly achieve from this game is 200 points, as it is an Xbox Live Arcade title. In summary, this game is absolutely amazing and for the price, you’ll be hard-pressed to find a game with a higher replay value on the Xbox Live Arcade Marketplace. Overall, there’s no denying the fact that this game is a complete overhaul that replaces the previous game 100%. Anyone who owns the original will most likely never play it again after having tried this one out. -Terrific eye candy all over the place. -Music is perfect and enhances the action. -New multiplayer mode is very fun and so far, flawless. -Achievements are well-made and the difficulty is just right. -Virtually no learning curve. If you can hold a controller, you can play this game. -All modes are unlocked very easily, making that aspect perfect for veterans of the original. -Simple user interface is very bright, easy to read and inviting. -Xbox Live multiplayer is not currently available. -Sound effects are more or less completely re-used from the original game. Most people will easily find something to love about “Geometry Wars: Retro Evolved 2”. Of course, not everyone will like every game, so download the trial before you buy this game if you’re unsure. However, any fan of the original game should buy this without any question. This is a near-perfect game.